Different options of the players list are explained below using the "desktop" view. Most options are exactly the same on mobile, but main difference is that different tables are showing less columns on mobile view compared to desktop view. First let's look at the Players list's default "General" view. General: This is the default view when Players list is opened. Mainly used for group management. Registration: This view can be handy when keeping track of paid and confirmed players or waiting list. More information at the end of this page. Add player: This button opens Add players view. From that list you can search and add more players to the competition. Remember to update other details (class, group) to a player after adding the player to the competition. Add me: Click action to add yourself into the competition as player. For example, if you have used the "main competition" record to get registrations and you can to copy players to first round after registration is completed. Auto groups: This button opens a view which can be used to automatically generate groups. See more details in the beginning on this page. Save: Remember to save any changes that you do on the players table! Different columns in the "General" view. All columns can be used to sort the date by clicking the column name. 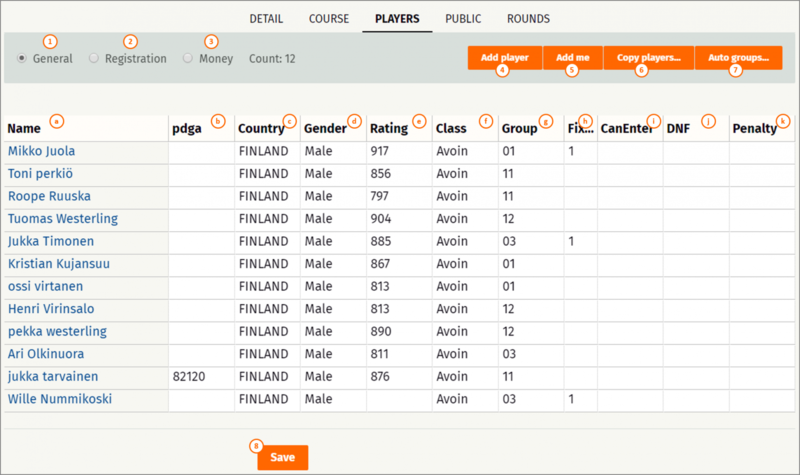 And all data except name can be changed also directly by clicking a table cell and typing or selecting new values. (b) PDGA number for the player. (c) Country of the player. For international competitions, different countries can be shown with flags on the results list. (d) Gender of the player. (e) Rating is the players rating before the round. (f) Class of the player, for example Open, Women, Amateurs, Junior, etc. (g) Group in which the player is included for the round. (i) Can enter is stating that player has mobile phone or other device that he/she can use during the round to enter scores. (j) DNF column can be used to mark DNF or DNS to a player. (k) Penalty can be used to give additional penalties to a player for braking the rules for example. Common use case is 2 points penalty when player has wrongly calculated his/her total score when returning a paper version of the scorecard. *Pro tip: Use Metrix to check your scores before returning them.